Dividing fractions by fractions is the next step in your journey in the Zapzapmath ecosystem, which has been riding on a smooth wave of mass progression and happy improvements, with mathlings worldwide learning mathematics at a phenomenal rate. The best part is mathlings from any part of the ecosystem get to put their math skills to use in a competition with other mathlings. Suddenly, you are getting reports of computers crashing and systems collapsing into an uncontrollable state of disruption. It turns out Decimalware ÷, a damaging software that attacks computer systems by dividing fractions by fractions, has infected ¾ of the computers in Zapzapmath, and you need to find a solution to battle this deadly virus! Luckily for you, you always keep your antivirus software up-to-date to prevent damaging viruses such as Decimalware ÷. To restore things back to normal and keep the ecosystem safe from further destruction, you need to utilize your unaffected computer to download the latest antivirus software onto removable USB flash drives and transfer them into the infected system. To fight the Decimalware ÷, two USB flash drives with different fractions are inserted into the affected computer system. This places the fractions into the system and reveals the infected areas in a line system on the screen. In order to complete the installation, you need to divide the decimals shown on the top of the screen. Convert the decimals into fractions to make it easier to divide them. You can do this by scrolling the numbers on the 2-dial combination until you cover all the infected lines in green, which represents the decimals in fractions. The right answer will complete the installation of the antivirus software successfully, while the wrong answer will cause the system to crash. You will have to reboot the question and retry until you can eliminate Decimalware ÷ from all the infected systems. Decimalware ÷ is a game that teaches you to translate fractions into decimals, and the process of dividing fractions by fractions. A fraction represents a broken part of a whole number. Fractions consist of two parts: the numerator is the name of the number that is above the line, and the denominator is the name of the number below the line. While the numerator signifies a number of equal parts, the denominator tells us how many of those parts make up a whole unit. A decimal is a number conveyed in the scale of tens. A decimal point is a dot that is used to separate the whole part of a number from the fractional part of a number. 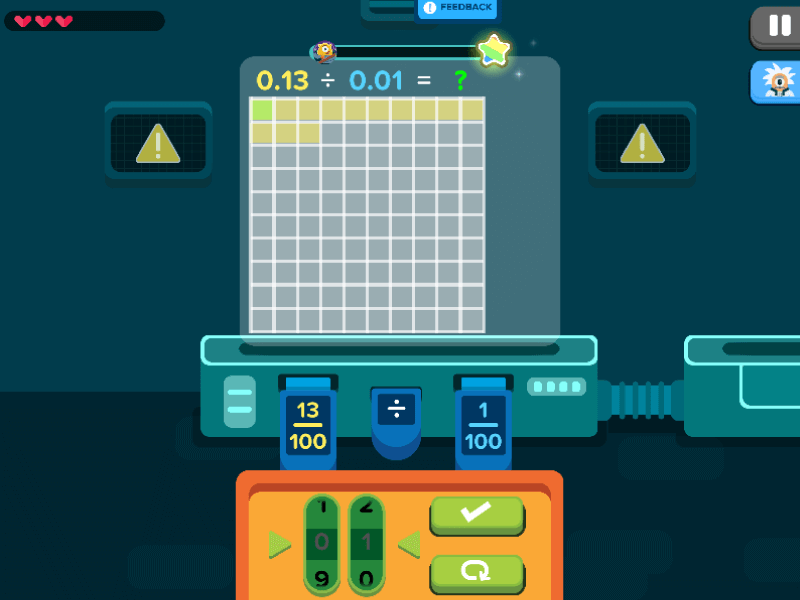 The method in which the game is designed allows fractions and decimals to be less intimidating and more engaging for a better player experience. The frequent motion of conquering virus by scrolling answers to cover the infected bars in green provides a casual approach to the learning process, stimulating the mind to enjoy as it acquires a new skill. Divide and conquer this whole virus!